Is there really such a thing as too many tacos? Yes. Yes there is. Also, you may have heard that we just had a major election here in the US. I hope those of you that were eligible to vote made it to the polls because my son did not. 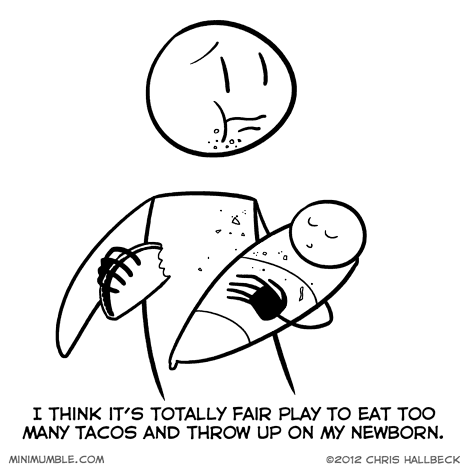 Depends on the taco. Guacamole, or not. Too many Tacos is how I discovered my Stomach problems, so now my body will not allow me to have tacos from that particular franchise. Awww….your poor son. 🙁 Great job handling it though. Of course there is such a thing as too many tacos. If you are unable to locate your car-keys/pets/children amidst all the tacos, you have too many tacos. If you cannot open/close your front door due to the taco pressure differential between inside and outside your house, you have too many tacos. If your tacos are plotting to rebel against you for declining taco living conditions that came about as a result of there simply being too many tacos, you have too many tacos. Albeit these are some extreme examples and I’m not exactly sure how the logistics would work to generate or accumulate so many tacos. Don’t throw up on your newborn, Chris. XD Might be fair play to you, but he can’t give you a bath like you will have to give him.